Quality printing while you wait, including enlargements. Free parking. 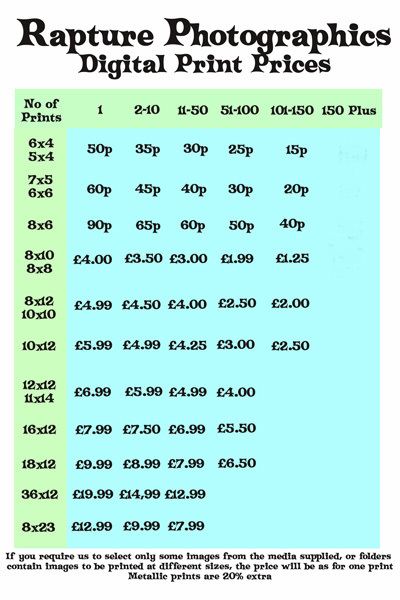 Please note the 150 plus rate is now no longer available due you paper price increases. Give us a try and don't settle for Ink Jet prints at other local stores, you can do that at home! Watch us print so you get exactly the crop you want. Student with photography exam work or portfolios to print? Give us a call for very special rates for both work produced on our wet lab and with our large format up to A1. We currently work with students from,The Hewitt, Thorpe High School, Earlham Academy,Wymondham College,The Gresham School, Hethersett,City College, Sir John Leman, Bungay High and NUCA and really enjoy the quality of the work. We guarantee the cheapest rates in a shop, in Norwich. If your school currently isn't on the list come and see us -we can still offer extremely good rates. We are happy to receive images via the internet for you to collect in store or we can post. For large files we suggest sending via www.yousend.com or you can email images to ji11y@yahoo.com with images for printing in the subject box. Our shop is just off Hall Road in Norwich next to Rish and chips near the Hewitt School. Price list we use Fuji Supreme and Kodak paper. Below are our in store prices.